The type 2270 from +GF+ is a rugged, high performance ultrasonic level measurement sensor, having transducer and processing electronics incorporated in one single housing. It provides all the sophisticated echo detection features of the well accepted 2260 Ultrasonic Level Transmitters. For single and multiple tank applications 2-wire sensors are recommended using either HART protocol or 4 to 20 mA for the direct communication with a panel mount controller or a PLC. Either for liquid level measurement in sumps or tanks, for tank contents measurement, or open channel flow measurement, the 2270 Level Sensors provide the answer. Sensing ranges up to 6 m are available. PP and PVDF sensor bodies provide best chemical resistance in applications where concentrated chemical shall be detected. 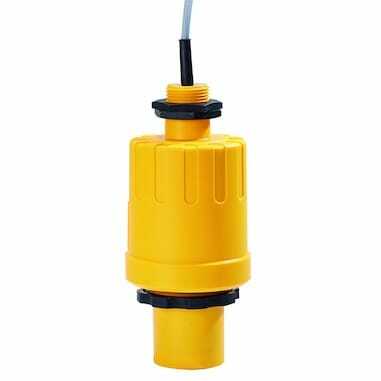 The type 2270 is a rugged, high performance ultrasonic level sensor, having transducer and processing electronics incorporated in one single housing.